Homemade flatbread has never been easier or more delicious. This ultimate veggie flatbread has a flavorful crispy crust and lots of fresh veggie goodness on top. In a large bowl whisk together warm water, sugar and yeast. Set aside until yeast activates – it will start to foam. Add in olive oil, salt. Slowly combine flour. Mix to combine ingredients with a dough whisk or wooden spoon. Knead the dough on a floured surface until it just comes together to form a smooth ball. Lightly coat the bowl with olive oil and place dough back in bowl. Cover with clean towel or plastic wrap and let rise in warm place for 30-60 minutes, until doubled in size. Once dough has risen, punch down and divide dough into two equal halves. Place one half back in bowl and cover. Roll dough out on a floured surface until very thin rectangle, about ¼ -inch in thickness and 10-inches in length. Place rolled out dough on an oiled baking sheet. Brush dough with garlic olive oil. Sprinkle half of the seasoning over the crust. 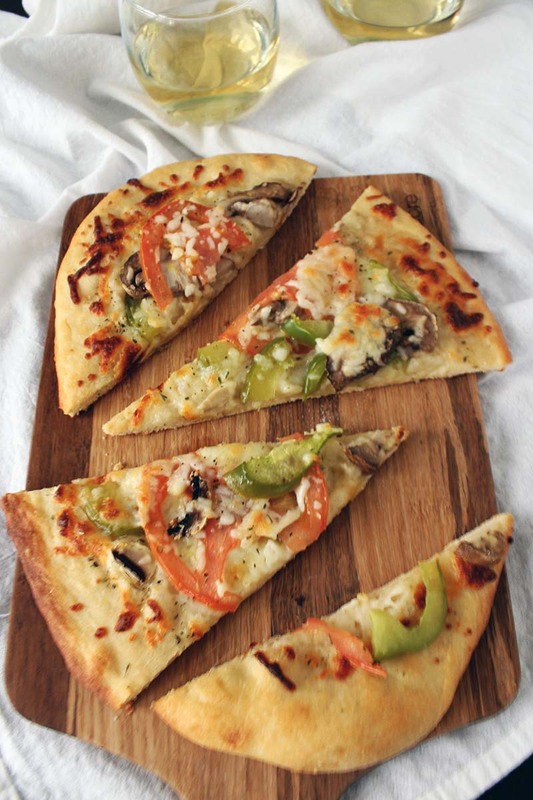 Scatter sliced veggies evenly over the crust. Top with mozzarella, Parmesan and remaining seasonings. Bake until golden brown, about 12-17 minutes.